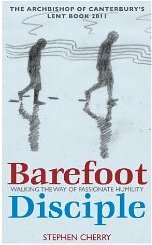 Dr Rowan Williams made a speech in favour of humility at Church House last night, while introducing the Archbishop of Canterbury’s Lent Book for this year, Barefoot Disciple: Walking the Way of Passionate Humility, by Canon Stephen Cherry. Part of the difficulty experienced by those who have achieved something amazing is that we have lost – if we ever had – the art of legitimate pride. If you work hard at something, put your all into it, and succeed in making or doing something well, there is nothing wrong with feeling proud of your achievement. The problem comes when you fail to acknowledge (to yourself) the part played by others. This is where actors and politicians find themselves in difficulty. Would Colin Firth have won ‘best actor’ if David Seidler hadn’t written a script for a film called ‘The King’s Speech’? Would he have if the Direction had been poor, the sets mediocre or his co-stars lack-lustre? It is right that victory speeches acknowledge the debt owed to so many people behind the scenes, including ‘my mother, who always believed in me and pushed me to do my best’. It is also right that Christians acknowledge their thankfulness to God for his direction, inspiration and sustaining power. But there’s nothing wrong with simply saying ‘thank you’ when someone congratulates you on a job well done. *GRIN* For those of you who didn’t get the reference, it is a line from the classic film ‘The Music Man’. And another very good example of appropriate pride – the mother has made very little conscious contribution to the musical talents of her son – though she may have bought his instrument and encouraged him to practise, the particular combination of genes that gave him the innate ability was completely out of her hands, yet we would think her unnatural, if not inhuman, if she did not express pride in his achievement.